The moray eel is long and snake-like with brown, smooth skin, eyes that have a milky-blue outline, and a mouth featuring large, pointed white teeth. People tend to think they look sinister because they usually have their mouths open, but the eels actually do this to pass water over their gills – this is how they breathe. In fact, while a moray eel will not hesitate to defend itself or follow prey, they generally don’t attack unless provoked. The moray is the only eel species in California without pectoral fins and have anywhere from 146 to 154 vertebrae. 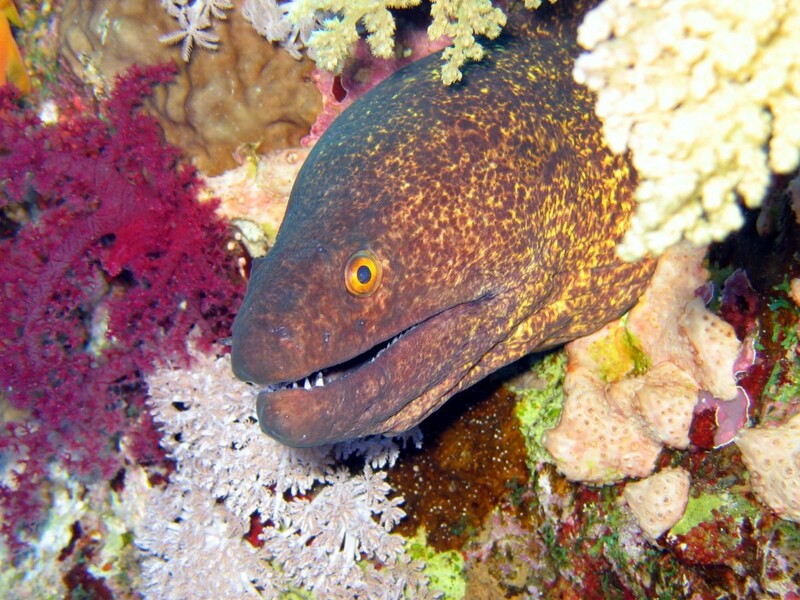 This accounts for an eel’s ability to slither through the water and in and out of reef cracks and crevices. They have been known to grow up to five feet in length and live for more than 30 years. When it comes to hunting prey, a moray is very aggressive. Since they feed mostly at night, their well-developed sense of smell is very useful. They can find a hiding octopus deep in its den and root it out. Their diet also consists of crustaceans, small fishes like Garibaldi, sea urchins, and green abalone. Moray eels can be found at marine depths of one to 40 meters (~131 feet) between Point Conception, Calif. and Bahia Magdalena in Baja California, Mexico. Morays particularly like to congregate on Catalina Island off the California coast, and one spot in particular has become popularly known as “Eel Land.” Scientists believe that the waters off the coast of southern California are too cold for eel reproduction and that ocean currents bring young eels up from Baja California. A moray’s best friend is the red rock shrimp who often shares its cave. The shrimp helps the eel by eating dead skin and parasites that plague it, and even cleans out old food stuck in the eel’s teeth. In return, the eel protects the shrimp from predators. It’s a perfect relationship! Moral eels actually have two sets of jaws. After they grasp prey with an outer set of teeth, a second jaw equipped with full set of long, curved teeth emerges from the throat to grab the food and pull it down into its esophagus. The whole thing resembles something out of a science fiction movie and takes only milliseconds. No other fish seems to have this feature. Come see four moral eels slithering in our tanks this holiday season. Moray eels are just a few of the 3,000 fish and invertebrates that thrive at Birch Aquarium at Scripps. By adopting one today, you can be part of the team that provides essential care to these special ocean inhabitants. Find out more about the aquarium’s Adopt-a-Fish program.